Echo Peak #3 from #4. 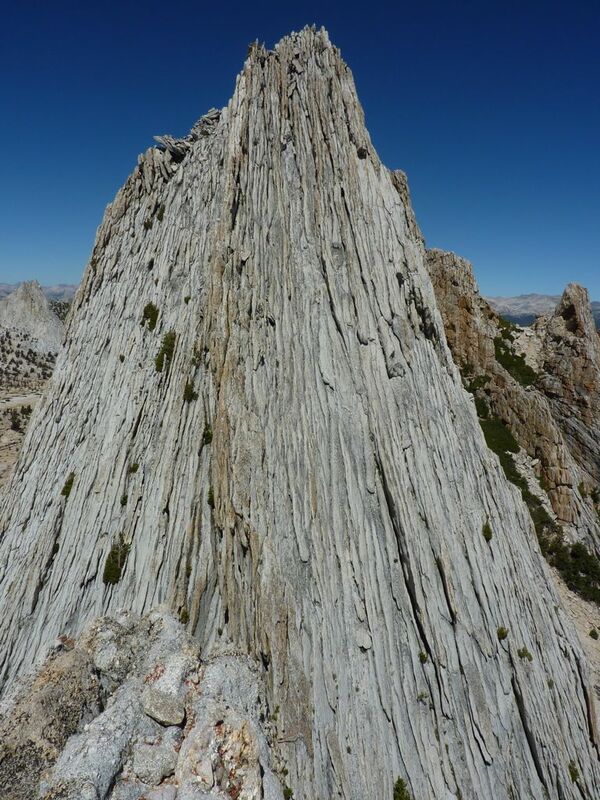 Yosemite’s Cathedral range consists mainly of Cathedral and Matthes Crest, with a bunch of small, named bumps between them boosting the summit count. It is a popular one-day traverse for either an average climber or a strong soloist — see Josh’s amazing traverse. Not having either the speed or the technical skill to match Josh, and wanting to experience all of Matthes Crest, I pared it down a bit by skipping the crest. Taking it north-to-south involves a 5.7 downclimb, which is a bit outside my comfort zone. I had no trouble finding the Budd Creek use trail off the main Cathedral trail — its being the approach to Cathedral’s southeast buttress helps — but screwed up a bit turning off toward Unicorn and had to deal with some woods before finding rock and slabs again. Unicorn is 4th class from the east and mid-5th from the north; I went somewhere in between and split the difference. I had something to eat, cruised the east side, and contoured right of the nameless rockpile between Unicorn and Cockscomb. Cockscomb is supposedly 5.6 or something from the east, but I looked around a bit and found some cracks that felt easier, heading up and left to a low point in the summit ridge. From there, I crossed to the west side and scrambled over to the summit, standing on the two highest-looking points for good measure. I managed to be a bit too clever downclimbing the west side, making it harder than necessary, then followed some footprints across the sand to Echo Ridge, one of the day’s easy summits. The Echo “Peaks” are interesting but annoying. There are actually about 11 or so points in the area, probably less than half of which are significant; nine have been chosen apparently semi-randomly as official peaks. There was a register on the second- or third-highest peak. I found myself repeatedly referring to Secor’s diagram to figure out what to climb next. Number 8 was a cruise, but number 9 has some supposedly 5.7 climbing on loose rock. I wasted over an hour looking for a route up that was within my comfort zone, but got stuck at a crux where the entire southwest face steepens, with an overhanging move on the lefthand side. After trying everything I could think of to get past this impasse, I carefully retreated and bagged the rest of the Echo Peaks. Rather than doing the stylish thing and soloing the SE buttress on Cathedral, I traversed around the west side, passing below some climbers on Eichorn’s west ridge. The easy route on Eichorn is obvious from a distance, and even more so up close, with several old pins and plenty of climbing chalk the rock. It is airy and very steep for its grade, but there are lots of great horns and cracks if you take the time to look, and the climb is short. I topped out just after a not-so-friendly roped party, then started down shortly after they started the standard rappel. As usual, I found raps don’t save people time — I passed the base of the rappel while they were still coming down. From here it was an easy climb to Cathedral, which I complicated by starting up the wrong (south) side of the summit pinnacle. The climbing is not hard, but rock on this popular climb’s final crack is getting smooth and greasy. I sat for a few minutes, then cruised back down the slabs, cutting through the woods to reach the Cathedral Lakes trail, where I jogged some for the heck of it. I had to cut through the woods to get around a couple of horse trains, which are relatively fast and not inclined to pull over for hikers to pass. I reached the trailhead in a disappointing 8h30, though that does include over an hour flailing on Echo Peak #9. Matthes Crest from the northeast. Wow. Echo peak #9 from #8. Echo peaks #8 and #9. Echo peaks 2, 3, and 4, from #5? Climbers on Eichorn’s west ridge. Echo Peaks, probably from Eichorn.